If a chronic, painful cough is keeping you home from work, you may need treatment for pneumonia. 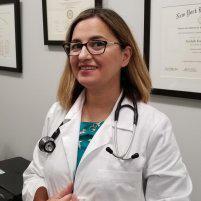 At Advanced Infectious Disease Medical in Hoboken, New Jersey, Avisheh Forouzesh, MD, offers a comprehensive examination of your lungs to identify pneumonia. She can also provide a variety of treatment options to relieve your symptoms and ensure you can breathe with ease. Learn more about treatment options for pneumonia by calling the office in Hoboken by making an appointment using the online booking feature. Pneumonia is an infection of the lungs that causes inflammation in the air sacs. These sacs may fill up with fluid, causing a persistent cough and a variety of other symptoms. The condition can be the result of bacteria, a virus, or fungi that enters your body and settles in your lungs. In some cases, pneumonia can become life-threatening for those with weak immune systems or other existing health conditions. Symptoms of pneumonia can range from mild to severe depending on the cause of the infection and your overall health. In addition to a persistent cough, you may frequently cough up phlegm and find it difficult to breathe. In older persons, pneumonia may cause changes in your mental abilities, causing you to feel confused or have difficulties concentrating. If left untreated, pneumonia may cause additional health complications, such as severe breathing difficulties, fluid accumulation in the lungs, and blood infections. These conditions can be life-threatening and need evaluation as soon as possible. If she confirms an infection, Dr. Forouzesh may perform additional tests to determine its cause and create the right treatment plan to relieve your symptoms. What treatment options are available for pneumonia? Once Dr. Forouzesh determines the cause of your infection, she may provide medications to ease the severity of your symptoms. These medications may include antibiotics for bacterial infections or antivirals for viral infections. In cases where pneumonia symptoms are severe, you may need to stay in the hospital for observation. Dr. Forouzesh may order hospitalization if you’re elderly, have dysfunction in your kidneys, need help breathing, or have abnormal blood pressure. If you suspect you have a lung infection, don’t delay an evaluation — schedule an appointment online or by phone to learn more about treatment options available for pneumonia.